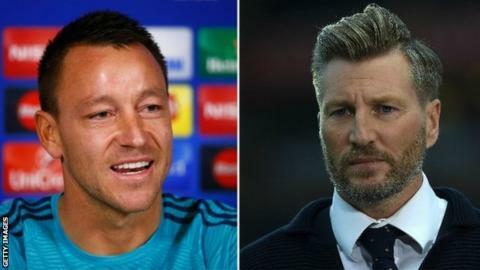 Robbie Savage believes Chelsea captain John Terry's wish to only be criticised by those who played at the highest level could leave the game "doomed". Terry singled out BBC Sport's Savage, saying he does not listen to pundits who "played at a really bad level". Former Wales midfielder Savage said: "John's entitled to his opinion. "It's a shame he thinks 99% of the industry - those of us who have not won the title or Champions League titles - is unqualified to express theirs." Writing in his Daily Mirror column, Savage added: "Apparently I am not entitled to venture opinions about Terry... because I have not won major trophies like fellow pundits Rio Ferdinand, Jamie Carragher or Gary Neville. "I only played 346 games in the Premier League, captained four clubs in the top flight and won 39 international caps. So much for playing at a really bad level." In August - after Terry was substituted at half-time in Chelsea's 3-0 defeat at Manchester City - Savage said the move marked "the beginning of the end" for Terry. The 41-year-old, who is also a pundit on BT Sport, insists he "only said what most of the country was thinking". But amid widespread criticism of Chelsea as a result of their poor start to the season, Terry told a news conference earlier this week that Savage had "dug me out a couple of times," adding: "I take it from the very best, other people - no." In response, Savage congratulated Terry on his 107th Champions League start in midweek - more than any other English player. But the former Derby and Birmingham midfielder highlighted Chelsea boss Jose Mourinho as someone who had not played at the highest level. "Terry has distanced him from the vast majority of people involved in football because he was effectively saying their opinions don't matter," Savage added. "If criticism is only valid when it comes from old team-mates who played at the very highest level, the game is doomed. "Perhaps, when I'm finished as a pundit, John will give me a job polishing all those trophies and medals he's won."